Economy & InnovationWhat Are Grain Bins Doing Next To IKEA? Will Hard-Line Critics Scuttle Iranian Talks? It's MORNING EDITION from NPR News. I'm Renee Montagne. Good morning. And I'm Steve Inskeep. The diplomatic push to answer questions about Iran's nuclear program has generated some hope for a peaceful solution. It has also inspired a backlash and negative response in both Iran and the West. On both sides, conservatives who would not normally agree about much seem to agree that nuclear negotiations are a dangerous idea that could produce what they would see as a bad deal. Talks on Iran's nuclear program ended today in Geneva. The outcome? Inconclusive but hopeful. Negotiators agreed that Iran has put forward an important proposal that needs to be fleshed out. As NPR's Peter Kenyon reports, all eyes turn now to another round of talks early next month. Can Iran, The West Overcome Distrust To Make A Nuclear Deal? Tomorrow, nuclear negotiators for Iran and six world powers will meet in Geneva. It's a chance to see whether positive signals from Iran's new president can be translated into real progress at the table. Iran wants punitive sanctions lifted, but it's insisting on its right to enrich uranium for peaceful purposes. NPR's Peter Kenyon reports that with hardliners waiting in the wings, momentum toward an agreement needs to be generated quickly. 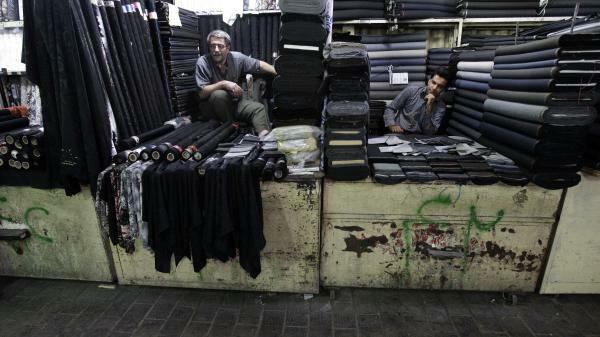 Two Iranian textile merchants wait for customers in Tehran's main bazaar. President Hassan Rouhani has raised hopes by reaching out to the West and promising to work for an end to sanctions. But his team has cautioned that the country's economic problems have deep roots. The U.S. and its Western allies have not been able to win the nuclear concessions they have sought from Iran. But they have been able to inflict considerable economic pain through sanctions. But now, Iran's call for a nuclear agreement and an end to sanctions has raised hopes among Iranians that better economic times may be ahead. The Iranian currency has stabilized somewhat since the election of President Hassan Rouhani, although inflation and unemployment remain high. 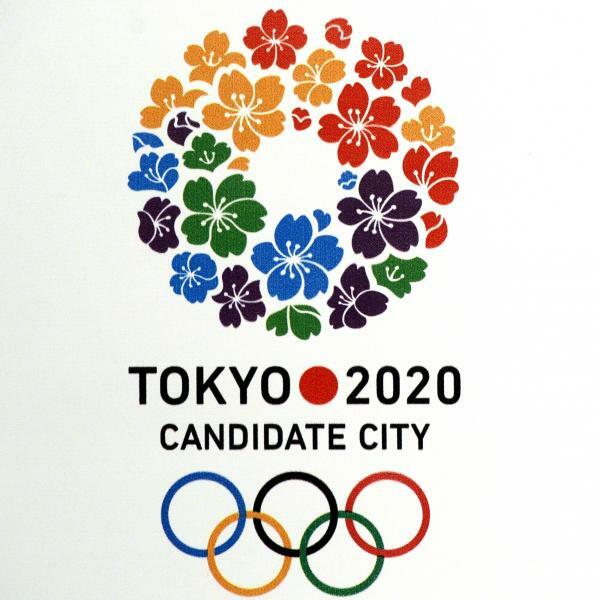 Tokyo's 2020 candidate city logo. Saturday in Buenos Aires, Argentina, the International Olympic Committee will announce the host of the 2020 Summer Games. The committee is choosing from among Istanbul, Madrid and Tokyo. The contenders all have strong selling points, but each also has serious issues clouding its bid. It might have seemed unthinkable just a few weeks ago, but today in Egypt, former President Hosni Mubarak was released from prison. Mubarak ruled the country as a police state for almost 30 years, but had been behind bars since the 2011 popular uprising centered in Tahrir Square, Cairo. He's still not a free man, though. Judges have ordered him kept under house arrest. 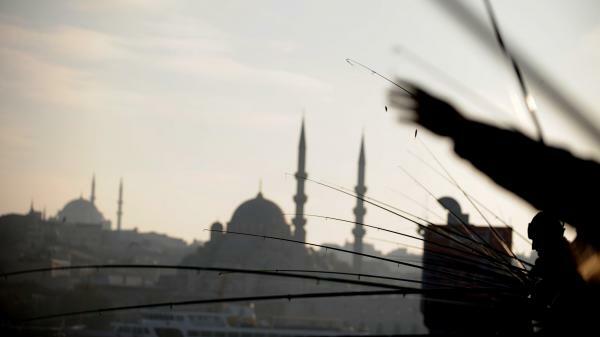 Anglers fish off Galata Bridge in Istanbul in 2011. The bridge is within site of the modest waterside restaurant Akin Balik. Each morning as dawn breaks over the Bosphorus Strait in Turkey, a small drama repeats itself: Massive oil tankers and cargo ships slide past tiny fishing boats bobbing on the surface like bathtub toys. These intrepid fishermen are out in all weather, in all seasons. In the winter, they catch the rich, oily anchovies, bluefish and mackerel. With spring come the turbot and sea bream, and by summer, sea bass and red mullet are being hawked by the fishmongers. Iranians surf the web at an Internet cafe in Tehran on April 28, 2013. The recently elected president, Hasan Rowhani, has suggested that he may loosen restrictions on the Internet. Iran's President-elect Hasan Rowhani has already called for less filtering of the Internet, saying Iran must maintain its principles, but also needs to engage with the wider world. "We should rectify our relations with the world," Rowhani said in remarks carried by Iran's Press TV. "Gone are the days when a wall could be built around the country.... Today there are no more walls." In Turkey over the weekend, police used water cannons against demonstrators in Taksim Square. The latest confrontation comes at a delicate time. Turkey is waiting a decision on whether it will host the 2020 Olympic Games. NPR's Peter Kenyon reports from Istanbul that Turks are wondering if the government will react with even tighter restrictions on descent, or bend to demands for greater political openness. Amid the protests and clashes in Istanbul's Taksim Square, a pianist has been hauling in his instrument at night to entertain the crowds. Each time he does, the raucous crowd stills itself while he plays. In between tunes, chants rise up and he stands on his piano bench to conduct the crowd. is a service of the University of Missouri-St. Louis.